The canal is one of the popular tourist attractions of the region. 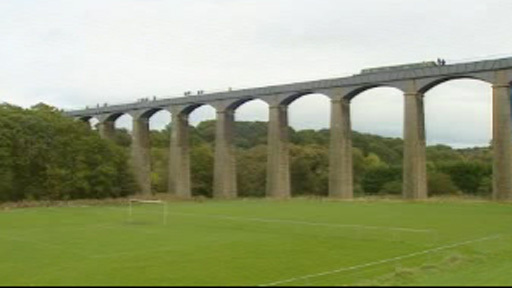 Supporters of Pontcysyllte aqueduct staged displays and activities to mark its world heritage status. The 200-year-old aqueduct near Wrexham was listed by the United Nations Educational, Scientific and Cultural Organisation (Unesco) in June. Events in Flexsys Field included animal displays, fairground rides and stalls by community and environmental groups. A plaque was unveiled, while the Swedish professor who assessed the site presented its Unesco certificate. The day, which ends with a lantern parade and fireworks display, aims to celebrate the years of campaigning to have the structure, built between 1795 and 1805, acknowledged as culturally significant. The world heritage listing puts the aqueduct among 900 sites around the world, including Stonehenge, the Great Wall of China and Taj Mahal, under Unesco protection. The 1,000 ft (305m)-long structure carries the Llangollen Canal above the Dee Valley and attracts around 250,000 visitors a year by boat or on foot. Wrexham council and British Waterways, which both supported the bid, organised a day of events and activities for the communities that come within the 11-mile designation of the Unesco listing. The official ceremonies began at 1300 BST with a flotilla of canal boats crossing the aqueduct with crew dressed in historical costume. This was followed by the unveiling of the plaque and the presentation of the Unesco certificate by Professor Castensson. There was also the signing of a concordat by the seven communities in the area to pledge their support to the aqueduct. The community events included an arena with a series of animal attractions including ferret racing, birds of prey, rescue horses and duck herding as well as puppet shows, a magician and ventriloquist. In addition, there were fairground rides, demonstrations of traditional canal crafts and and the chance find out how the aqueduct and canal were built by engineers Thomas Telford and William Jessop. The day also included a performance by Froncysyllte Male Voice Choir. The stalls were open from 1300 BST - 1800 BST, with entertainment provided in the main marquee from 1430 BST to 1900 BST, with a lantern parade at 1900 BST and the firework finale at 1915 BST. A spokeswoman for Wrexham council said: "It's a momentous occasion for us for the aqueduct to have gained world heritage. "We have been working towards it for four or five years. It's the culmination of a lot of work. "Without the support of the community, we would not have got the status, so it's something for all to celebrate."